With Cleo Active massager for legs, it's so easy! Cleo Active massager for legs provides a simple yet effective, relaxing 20 minute compression massage treatment in the comfort of your own home. Cleo Active massager for legs not only invigorates your legs, it looks after your entire body and can help a variety of people …from the athlete to the elderly, office workers to those on their feet all day, in fact anyone wanting to revitalise or improve the condition of their legs. Stimulating the legs and feet by pneumatic air compression massage, which mimics the pumping action of exercise, it gently applies and releases pressure to the lower legs and feet, which is relaxing, soothing and comfortable. We often forget just how important healthy legs are to our general well-being, and as modern living involves less exercise, it’s crucial to keep them as stimulated as possible, even if we’re unable to sustain physical activity. Legs play a vital role in circulation, helping blood flow from the feet to the heart, so, if they aren’t regularly exercised, we’re at risk of developing poor circulation, which can lead to other more serious leg problems. Unlike our animal ancestors, we stand upright, making our bodies work against gravity to pump blood back up to the heart. Our legs play a crucial part in ensuring it flows around the body efficiently, so keeping them active is essential to our general well-being. Our muscles need a constant supply of fresh oxygen and nutrients, which are provided in the blood stream and generated through exercise. Lack of activity inhibits healthy circulation meaning that our muscles don’t get what they need, so they become fatigued and cause discomfort. Lack of regular exercise and leg stimulation can lead to the development of serious problems such as: varicose veins, spider veins, DVTs, or simply unhealthy looking aching legs. Without the help of exercise contracting the muscles and pumping blood to the heart, our legs are much more inefficient at their job. Although lack of exercise is generally a matter of choice people who sit or stand for long periods through work or have mobility constraints are at particular risk. Used on a regular basis, compression massage in the form of Cleo Active massager for legs can make your legs feel more relaxed and improve your general well-being too! 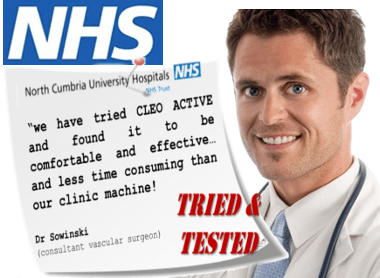 Dr Sowinski, consultant cardiovascular surgeon at Royal North Cumbria University Hospital used Cleo Active massager for legs on a number of patients and was very satisfied with the results, particularly as it could be used at home as often as they required in between visits to his clinic.
" we have tried CLEO ACTIVE and found it to be comfortable and effective...and less time consuming than our clinic machine!"